In the summer of 1990, the SEC did something it had never done in its first 58 years of existence: add new members. The conference had lost members before, notably Georgia Tech in 1964, and for a quarter-century afterwards, the SEC was content to play as a ten-team league. That began to change in December 1989, when the Big 10 sparked the Great Realignment of 1990 by pursuing Penn State as its 11th member. Less than ten months later, the SEC found itself with two new schools in Arkansas and South Carolina. The foundation of SEC expansion was actually laid several years earlier, in 1984, when the U.S. Supreme Court ended the NCAA’s monopoly over college football television broadcasts. A group called the College Football Association (CFA), which included the SEC schools, sued the NCAA to in effect “deregulate” television rights. The CFA’s legal victory enabled the group to negotiate a single-network contract with ABC in the late 1980s. But in February 1990, Notre Dame withdrew from the CFA and signed its own exclusive contract with NBC. Shortly thereafter, the Federal Trade Commission challenged the CFA’s contract as a violation of federal antitrust law — a dramatic twist, given the CFA previously won its freedom by arguing the NCAA had violated antitrust law. The FTC lawsuit never went anywhere, but by the spring of 1990, it was becoming clear to all the major players in college football that the days of organizing TV rights along national lines was over, and going forward it would be up to the conferences to maximize their television exposure and dollars. For its part, the SEC wasn’t going to sit idly on the sidelines. On May 31, 1990, the SEC presidents voted to authorize expansion, identifying six schools as potential members: Texas, Texas A&M, Florida State, Miami, South Carolina and Arkansas. Ole Miss President Gerald Turner headed the conference’s expansion committee. He told the Washington Post that the CFA’s inevitable decline meant the SEC would negotiate its own television contracts in the future and that the “first step in that direction is minimizing the force of competing conferences in our geographic area.” In other words, the SEC wanted to keep the Atlantic Coast Conference and a potential Big East football conference out of the State of Florida. But SEC Commissioner Roy Kramer also wanted to go on the offensive. Keith Dunnavant noted, “The SEC’s area of dominant influence fell short of the footprint desired by many consumer-oriented companies,” which Kramer sought as sponsors. To make the “footprint” more sponsor-friendly, Kramer wanted to move into South Carolina, Arkansas and especially Texas. By targeting Texas, Texas A&M and Arkansas, Kramer had effectively declared war on the Southwest Conference, where all three schools were members. It was one thing to recruit independent schools; the SEC was contemplating an unprecedented raid on a fellow conference. Yet the time was ripe to strike the SWC, which then consisted of seven Texas schools and Arkansas. The SWC’s small footprint meant it wasn’t a terribly lucrative conference. Arkansas Athletic Director Frank Broyles said his school would make $1 million more a year by switching to the SEC. And the SWC was rocked by a series of scandals that enveloped most of its Texas members, notably Southern Methodist University, which the NCAA shut down in 1987. Arkansas was also eager to swap the low-level competition in the SWC — e.g., Rice and Baylor — for stronger SEC foes like Georgia and Tennessee. When the SEC formally approached Arkansas, there was no hesitation: On August 1, 1990, the school’s trustees unanimously voted to join the SEC, effectively the following July. SEC expansion, however, meant adding at least one more school. 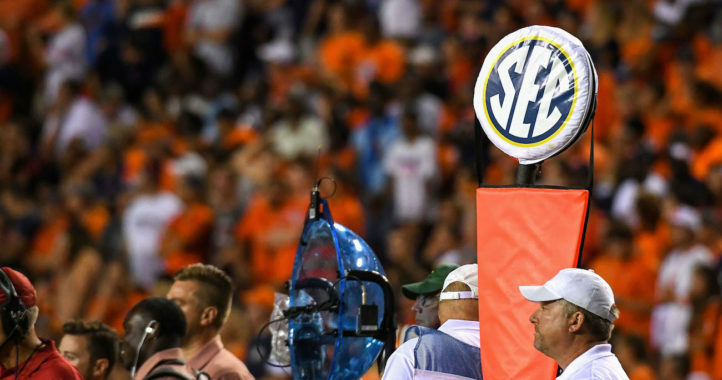 The SEC planned to take advantage of a little-known NCAA rule that allowed a conference with 12 members to organize as two divisions and play a separate conference championship game. The rule was originally adopted for the benefit of a Division II conference, and no Division I-A conference had ever invoked it. Kramer and the SEC presidents quickly realized that a championship game would make a future television package far more attractive to the networks. The magic 12th school would not come from the State of Texas. Although Texas and Texas A&M were on the SEC’s original expansion wish list, politics made either a non-starter. With Arkansas’ likely departure, the SWC would collapse without its two biggest Texas schools. That was unpalatable to Texas legislators — many of whom were alumni of the other five SWC members — and Texas and A&M were publicly threatened with retaliation if they left. Eventually, the SWC did dissolve, with most of the Texas schools merging with the Big Eight into the Big 12. Things came to a head in September 1990. The ACC had dithered for months on the issue of expansion. On July 26 ACC Commissioner Gene Corrigan said there was “no rush” to expand, yet behind-the-scenes, he was fervently working to lure Florida State away from the SEC. On September 2, Corrigan made his presentation to FSU officials in Tallahassee. Nine days later, the SEC’s Kramer made his final push. The next day, September 12, things nearly blew up in Corrigan’s face when only three of the ACC’s eight athletic directors voted to expand at all. Corrigan needed at least six votes, and while he knew two members (Duke and Maryland) would vote no, three of the North Carolina schools had surprisingly abstained. While Corrigan lobbied the three abstainers to agree to a second vote later that evening, Kramer quickly arranged a own conference call of SEC members to vote against inviting Florida State. Whether this was a face-saving move or an attempt to spite FSU (in the event the revote went badly) is unclear. But the SEC decided to move on. Corrigan got his revote and won, and on September 13, FSU officially joined the ACC. Four days after spurning Florida State, Kramer met with Miami, one of the two remaining expansion candidates. 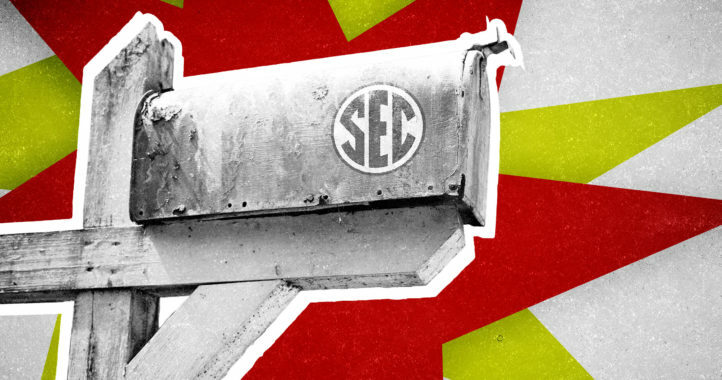 South Carolina’s trustees had preemptively voted to accept an SEC invitation should one come. Miami was decidedly less enthused. Unlike the mostly public universities in the SEC, Miami was a private school that drew its student body in large numbers from the same geographic area as the Big East. Miami officials were also more interested in using Big East membership to improve its fledgling basketball program. South Carolina was the last school standing. Kramer met with officials in Columbia on September 20, and on September 25, the Gamecocks received their official invitation. The SEC got its 12th member and a championship game — and in 1995, its own television contract with CBS — while South Carolina, which as an independent faced a $300,000 deficit the previous year, received a measure of financial security. When Miami officially joined the Big East on October 9, the Great Realignment of 1990 finally came to an end. I really enjoy these articles. Great perspective for the current SEC expansion talk. Keep ’em coming! Do you think I could see the Bobby Bowden quotes from the Atlanta Journal?! My FSU friend thinks you made it up! And think that you are just talking SEC propaganda! (When you think the SEC vs every other conference stats would be enough to prove that SEC is the best) It would be nice to see the article so I can actually prove to him the Bobby Bowden said that! And how I try to compare FSU and the ACC to Boise State and their old conference! It is easy to dominate a conference when you are heads to tail the best in that conference! The Bowden quote came from a story in the August 3, 1990 Atlanta Journal-Constitution. I actually looked this up on microfilm at the library, so I don’t know if it’s available online. geez….”I think you made it up”….yeah, right. In this day and age of reporting. Who in their right mind is going to “make up” a story that is so easily verifiable ? Actually the Southwest Conference prior to 1990 was Arkansas plus EIGHT schools from Texas. They were Texas, Texas A&M, Texas Tech, Baylor, Rice, SMU, TCU, and Houston. The league existed as an 8-team conference for 4 or 5 years after Arkansas left. But, SMU had it’s football program dismantled for 2 years and I believe as of 1990 they were just starting to put their program back together, so effectively it was 7 TX teams. SMU sat out 1987 and 1988, then resumed play in 1989. You can’t really “effectively” be a 7 team conference if you have 8 teams, and regardless the article fails to even make the distinction. Wow, this article appears to paint South Carolina in an extremely favorable light. It is clear that the powers-that-be at SC, at the time, were exceptionally gifted with incredibly good foresight. What a coup for the Gamecocks to have entered the greatest league in the country twenty years ago. These days, FSU and her fans, may have two ill-gotten MNC’s under their belts because of their fear of playing in the finest league in the country, but they also find themselves on a downward slope the longer they remain in the pathetic ACC. So, naturally, now FSU wants in huh? I say, let them eat cake. I noticed GA Tech was never on the expansion list. They had their chance. Now for the next expansion, in the next few years, rumor has it the SEC would love to bring on North Carolina and Oklahoma. Both would be very long shots, especially pulling UNC away from the ACC but getting A&M was once a very long shot too. Perhaps Clemson instead of UNC, but they have shown no interest and SC may veto such a move.